The Nostalgic 2 Days turned out to be quite the surprise for me, a refreshing change from the regular events I usually cover. 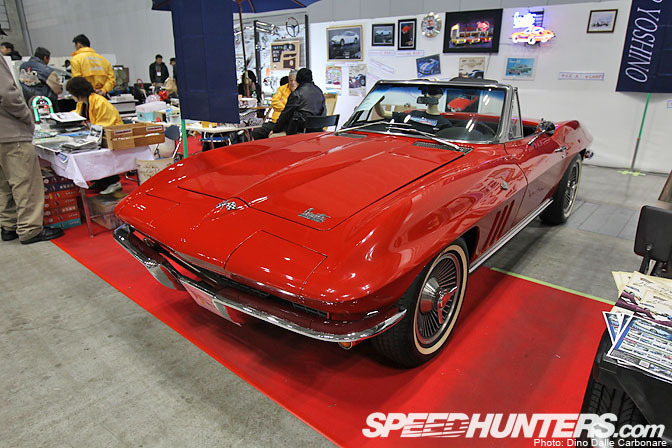 This is a show that really puts quality above anything else and I really have to congratulate the guys at Nostalgic Hero magazine for organizing such a great gathering of the best vintage rides Japan has to offer. I mean they even picked some cars to be driven up in front of the main stage and revved so the crowds could appreciate the sounds of these incredible machines. 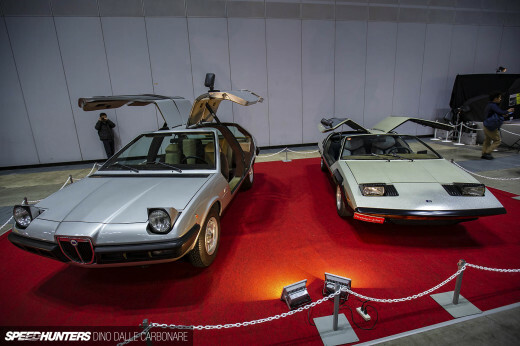 This may have caused the exhibition hall to fill up with exhaust fumes, smells that mixed together with the wafting aroma of well aged-metal and leather not to mention that faint hint of gasoline carbed cars always emanate. 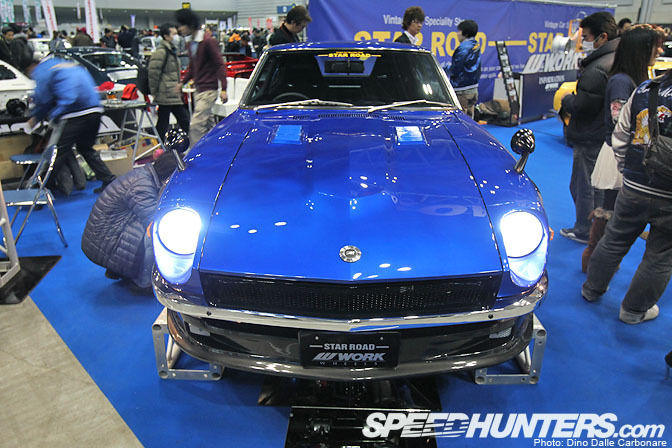 The Star Road stall was the first one I stopped by, the blue S30 Fairlady Z demo car that I featured back in October 2011 taking center stage in what was one of the biggest exhibitions at the show. 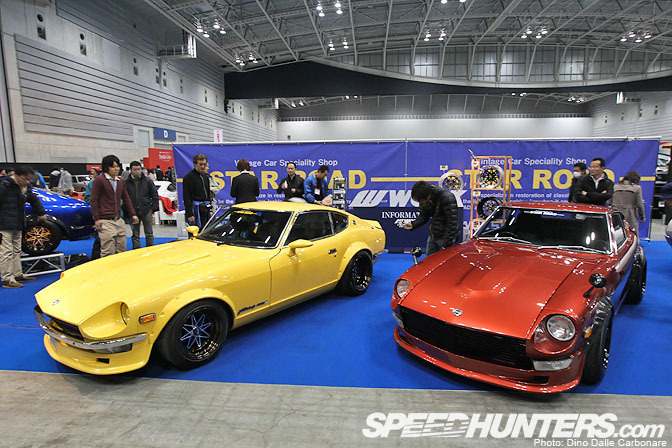 It was joined by two more stunningly finished Zs, the yellow one shown last month at the Tokyo Auto Salon. …and it was this metallic red example that really did it for me. Just like the blue demo car this S30 was fitted with carbon fiber overfenders and like most of the vehicles these guys build, it was riding on a set of 15-inch Work Equip 03s with black anodized lips. 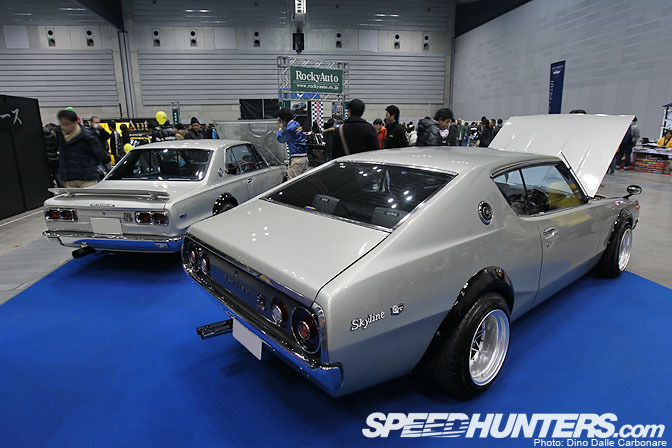 Inoue-san at Star Road also specializes in Syklines and joining the Zs was this Ken Mary and Hakosuka. Work brought a few examples of the 03s to show a few variations on colors. 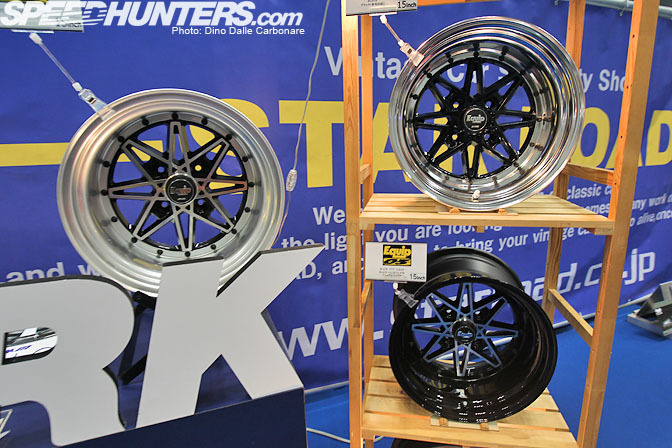 Epic rims for equally epic cars! 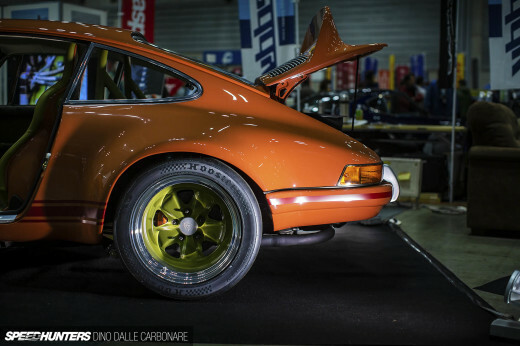 …to cool parts to build up and modify your classic car. One of their latest products that were also fitted to the blue demo car when I shot it in Fuji Speedway, is their universal air conditioning kit which comes with everything you need to fit it to your Skyline or Z. No more sweating it off during the scorching Japanese summer! 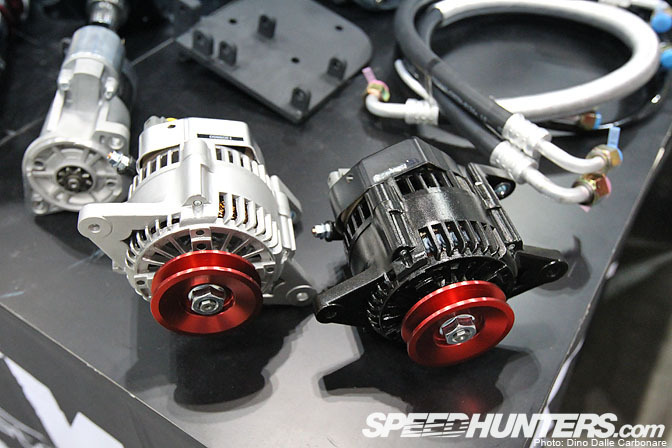 Rebuilt alternators are some of their hottest selling parts and components that sooner or later everyone has to replace. 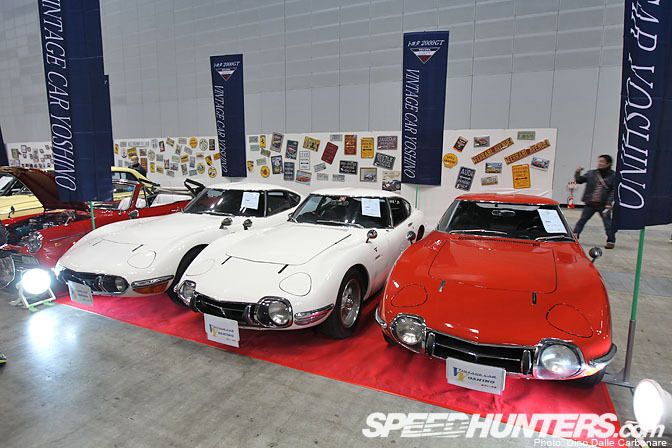 Vintage car shop Yoshino had a nice, and may I add extremely tightly packed, line up of rare cars like this triplet of Toyota 2000GTs…all for sale if anyone out there is interested! The red one was a rare left hand drive model. Ever wondered why the TRD hood for the Supra had those triangular vents? 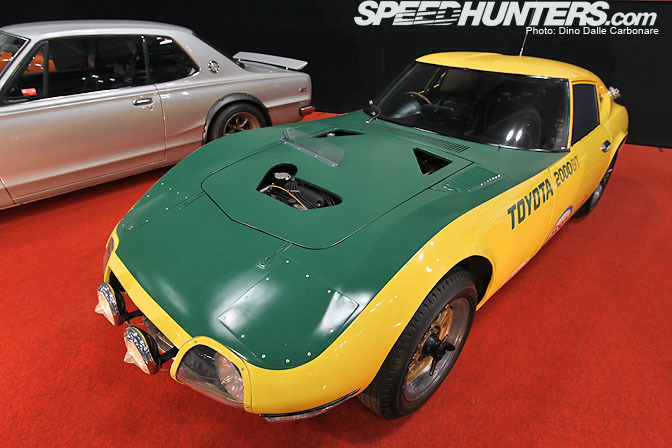 Well here is why, similar shaped openings were cut out of race versions of the 2000GT like this yellow and green Speed Trial version built in 1966. And since we are on the subject of rare cars here is one of the rarest out there, a Z432R version of the PS30, built for race car homologation. Under that black hood is an S20 engine borrowed from the Skyline 2000GT-R. I recently drove one of these cars around Sodegaura Forest Raceway so you can expect a little feature on that soon! I wonder how 800 turbocharged horses feel like in a 620 kg car! 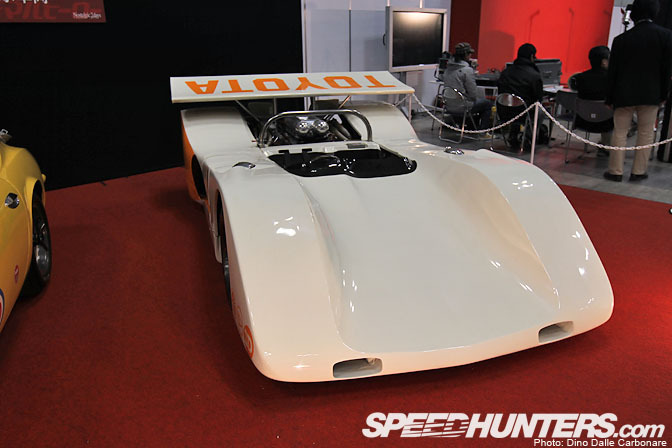 This 1970 Toyota 7 is the twin turbocharged version of the cars that competed for a couple of years at the Japanese Grand Prix. 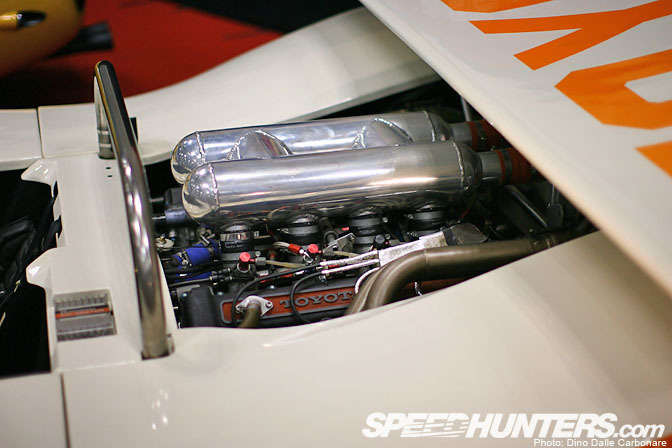 The big blowers were mounted behind the engine on each side of the gearbox, a measure to boost power so the cars could compete against faster entrants like Nissan R382s and Porsche 917s. Regulations changed in 1970 so the 7 never got to run in this configuration. Here is a look at the massive handmade intake plenum that fed those eight hungry cylinders. Another great sighting at the Vintage Car Yoshino display. 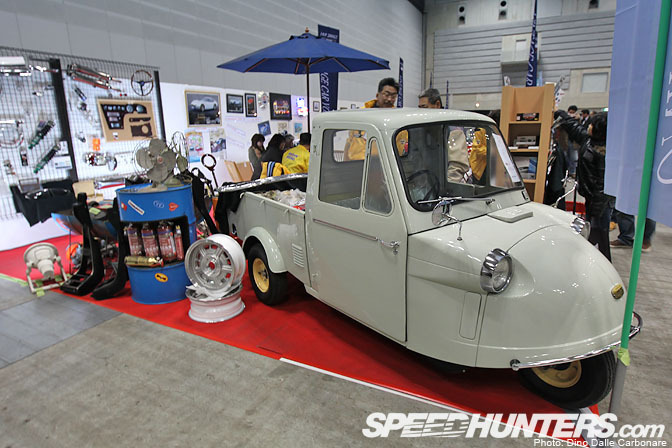 The original 1957 Daihatsu Midget, one of the most popular commercial vehicles in Japan at the time. …a 590HP RB26. 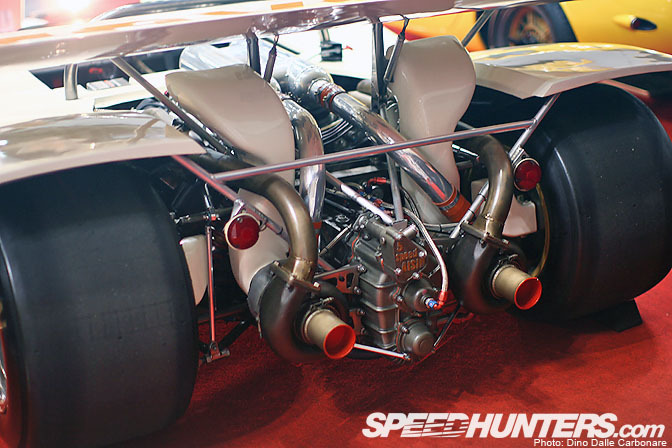 Next to the gold-top engine sits an HKS T04Z turbo charger which supplies 1.5 bar of boost. Since the intercooler piping has been kept so short Watanabe-san told me that the response is impressive for such a big turbo. 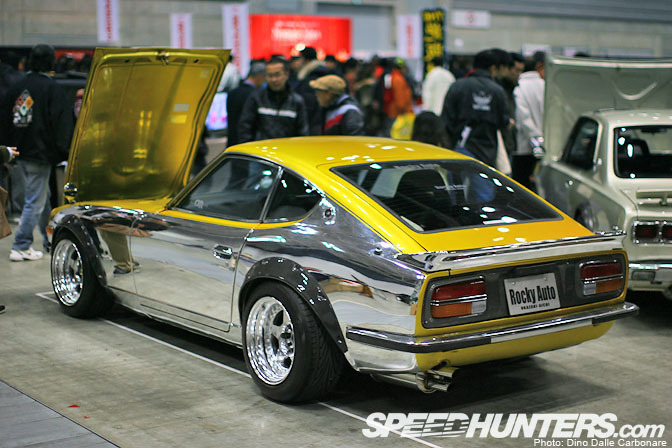 Quite a mean looking S30! 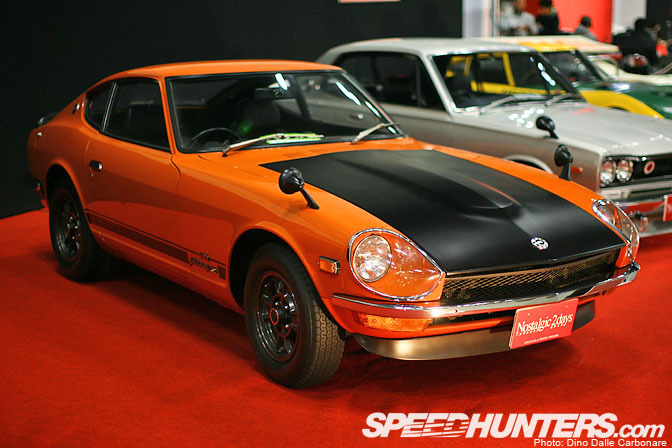 …but supercharging an L28 and dropping it into a US-spec Datsun 240Z was a first. With 320HP it makes the car very balanced and tons of fun to drive. This very flashy S30 was their 2012 TAS build and it goes back to a more old-style approach with a naturally aspirated motor. No L28 here though, but an NA version of the RB26 good for 260HP. And while we are talking about engine swaps this 510 Coupe from Common Snapper literally had me drooling. Obviously Miyamoto-san, the man behind this Mie-ken based shop, knows what he is doing with his custom creations. 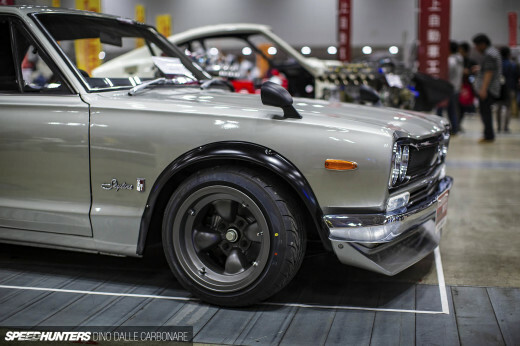 This little Datsun was immaculate from every angle and riding on a set of 16-inch Barramundi Designs 3-piece wheels. …as was the digital dash! The interior has been customized too with a one off center console, integrated navigation screen and tons of suede leather. 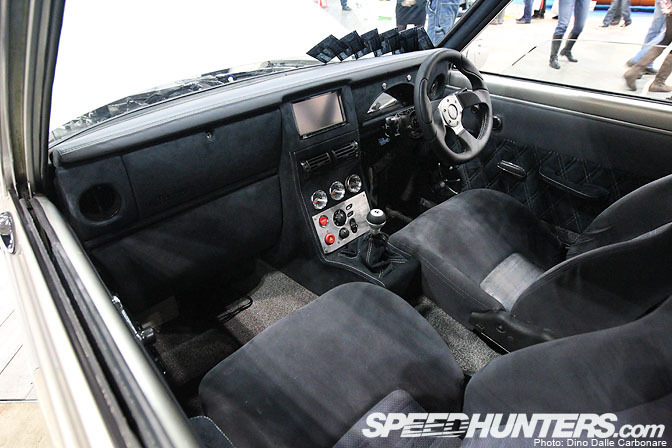 Seating is courtesy of two BNR32 GT-R chairs! More to come in Part 2, don’t miss it! Desktops of some of the Nissans please! MOOAR pictures of the first car please! That looks like carbon fiber and I must know more about it!! Speechless. Insane amounts of awesome! 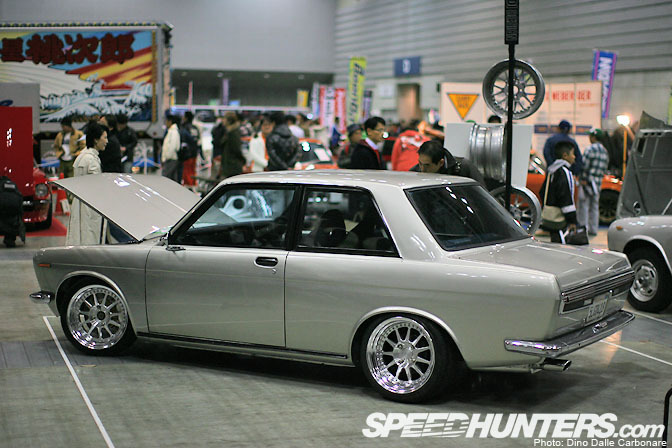 I want a 510 SO BAD! 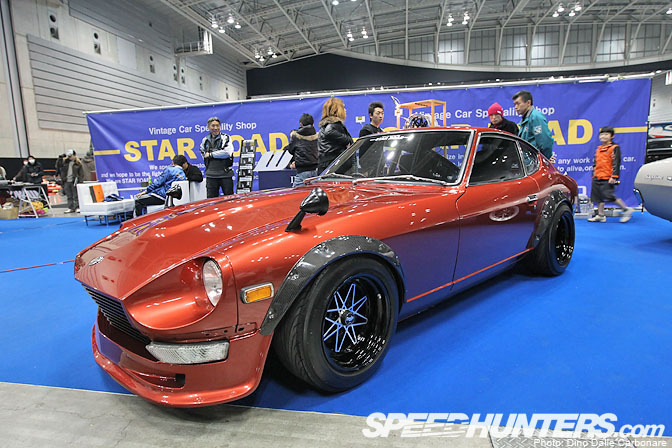 Star Road always builds awesome Z's. Thanks for covering this Dino. 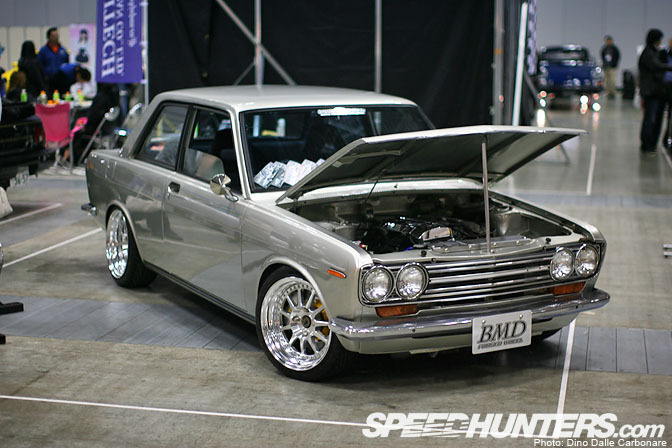 Love that 510, cant wait till i build one. 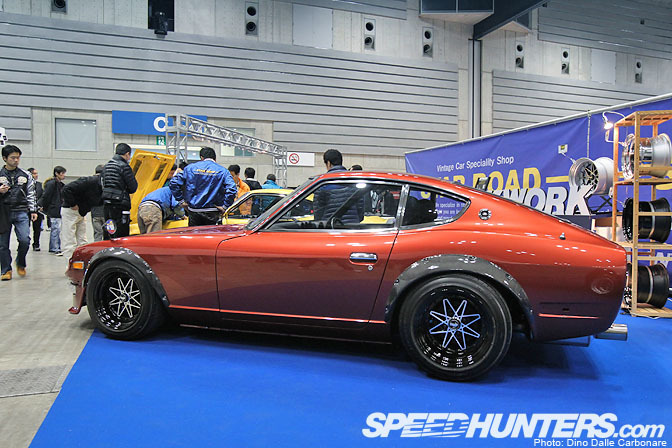 Could it be possible to get a desktop of that mean looking S30 that Watanabe-san at Rocky Auto built in 2010 for TAS? And also the 510 looks awsome! Great website btw! damn the 510 so f.ing awesome!!!! Seen a lot of S30's already, what interests me the most is that 510 coupe, Mike, full feature of that one please!!! Common Snapper 510...holy jeebus thats a great car. So much good stuff here, I'm going into sensory overload. Fairlady's and a fair lady. I just love the vintage look of the 510. Such a beautiful looking car. Looks like a nice show! Sorry I couldn't make it. Please keep photos coming. So much old Nissans... I LOVE this. Damn beautiful Datos! And that dime from Common Snapper is Focken Gorgeous! Cool show, definitely quality vintage J cars. Love the Toyota 7 money shot! Wallpaper that one please.